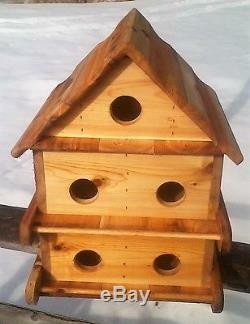 Handmade 10 chamber purple martin birdhouse with handmade perch. 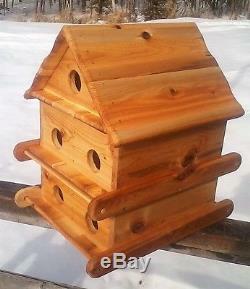 Made from 3/4 inch and 5/8 inch eastern cedar, will not rot or decay and insect resistant. Overall size 20 inches wide, 22 inches tall, and 16 inches deep. 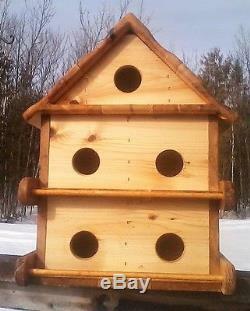 Nesting boxes are 5 3/4 x 5 3/4 x 5 3/4 deep, 2 1/8 inch entrance hole 1 inch from floor. No way to clean out the nesting boxes, but it is not really needed, birds will reuse the same nest over and over. Comes fully assembled and pre treated with oil to prevent graying. 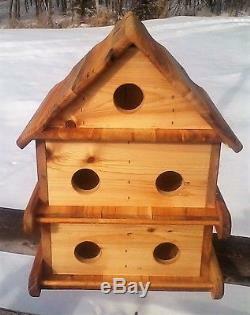 Visit my store The Birds Nest UP for many other handmade wildlife homes, feeders, and shelters. 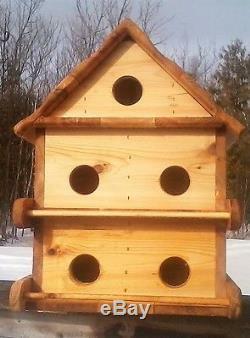 The item "Handmade 10 chamber square purple martin birdhouse. 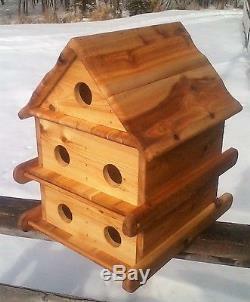 Cedar wood, The Birds Nest" is in sale since Monday, February 06, 2017.